A project to once again retrieve lost fishing gear and save wildlife in Scapa Flow got underway this week. Ghost Fishing UK is revisiting Scapa Flow for its annual underwater clean up project. The project began on Saturday, and later this week they are due to be joined by representatives from World Animal Protection and directors from the Fat Face Foundation, the charitable arm of international clothing brand Fat Face. 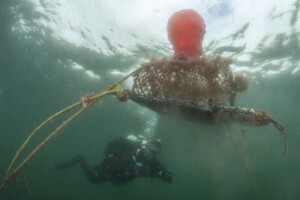 Ghost Fishing UK, a group of dedicated scuba divers, scientists, conservationists and project partners, will be spending the week surveying and recovering ‘Ghost Fishing Gear’. This is any abandoned, lost or discarded fishing gear which continues to catch and kill marine life, also acting as bait for more animals which in turn become trapped. Two local dive boats are involved in the project. Bob Anderson, owner of dive charter vessel MV Halton has supported Ghost Fishing UK for the last 3 years. He co-ordinates the ‘Big Scapa Cleanup’ which is a project dedicated to cleaning up marine litter in and around Scapa Flow. George Simpson of MV Sunrise will be skippering the training boat, which will also accommodate the project partners and representatives from World Animal Protection and Fat Face. Further details in The Orcadian on Thursday. Next Post>The Islander Competition – Last chance to win a luxury trip to Orkney!